This is a trick that will make the half rosette unnecessary. It works for all kind of sticks that need securing, if only they have a hole in each end. Myself, I find it indispensable when securing lease sticks. 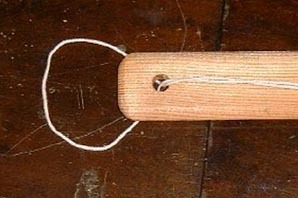 Cut a length of rug warp, seine twine or the like. 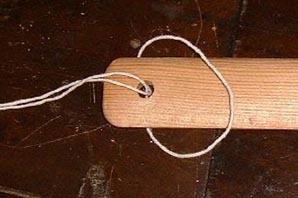 It should be double the length of the stick in question, plus some extra (some 6 inches is enough). 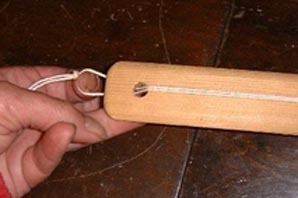 Thread the loop around the stick end. 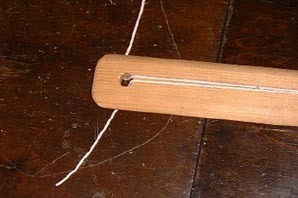 Thread the long ends through the loop, so that the loop is secured. Thread the other ends through the hole in the other end of the stick. take them to the other side of the stick. 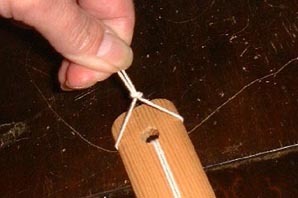 Make a secure knot on the upper side of the stick. 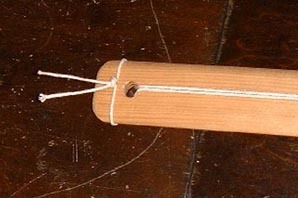 Since rug warp has some elasticity, it is possible to work the string around the stick end, to get it off and back on, without ever undoing the knot. I prefer to have my lease sticks separately secured. When beaming, it often helps to move the lease sticks individually.